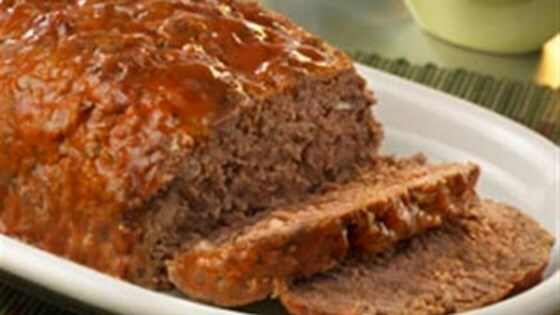 "What makes this meatloaf so good? The addition of tomato chipotle and olive oil soup yields incredibly moist and flavorful meatloaf. This is classic comfort food at its best!" Heat the oven to 350 degrees F. Thoroughly mix the beef, 1/2 cup soup, the onion, bread crumbs, egg, salt and black pepper in a large bowl. Place the beef mixture into a 13x9x2-inch baking pan and firmly shape into an 8x4-inch loaf. Heat 2 tablespoons pan drippings, the remaining soup and the water in a 1-quart saucepan over medium heat until the mixture is hot and bubbling, stirring occasionally. Serve with the meatloaf.